An infant was showing symptoms of failure to thrive. During home visits, supported by United Way’s Successful Children’s Network, a specialist from Children’s Hospital of Wisconsin guided a mother on how to interact with her baby while feeding him. The specialist showed her how to talk, hold and snuggle her baby during the feeding. After one month of teaching skills to encourage emotional and cognitive development, the child showed a measurable amount of improvement. Located in an Eau Claire County rural community, a mother of six was concerned for her two youngest children. They had no interaction with other children their age and the family was strained by her husband losing his job. Through support from United Way’s Successful Children’s Network, the Family Resource Center’s Rural Play Groups provided this mother the support she needed to ensure her children would be prepared for school and life. She almost never misses a session! A young man with a troubled past entered the Fresh Start program, where he and other supervised youths built a house and learned employment, money management and life skills. After two years, he successfully completed his probation and applied for the auto-mechanics program at CVTC. While on the wait list, he continued with Fresh Start and remained on the right track. During his last year of the program, he spent 1700 hours with the program, earned additional educational awards, and completed year one of the Auto-Mechanics program at CVTC. He began his final year at CVTC in September fo 2016 and has enough educational awards to complete college without any student loans. 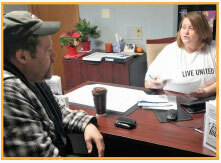 Through United Way’s Financial Stability Partnership, the Homeless Employment Linking Program (HELP) is offered by Western Dairyland EOC in collaboration with Family Promise of the Chippewa Valley (Beacon House). This program meets the employment needs of families with children who are experiencing homelessness. Through this collaboration, a mother who lived at Beacon House received assistance to enroll in and complete her one remaining class to obtain an Associate Degree in Nursing. When the client started her journey, she was working two part time jobs and making $11/hour; however, she is now working a full time position as a Licensed Practical Nurse making $18/hour. A woman had her child removed to foster care and faced incarceration. Instead she was placed into a United Way-funded program of counseling and rehabilitation through Bolton Refuge House in collaboration with the alternative courts. During her time in the program, she learned to manage her early childhood traumas. A year later, she was employed, living independently, and reunited with her child. When a woman who had lost her insurance over a year ago stepped into the Open Door Clinic, a United Way program partner, her blood pressure was dangerously high, her legs were swollen and she had become so short of breath that she had quit her job. She had acute congestive heart failure and a chronic heart dysrythmia and had not taken any medication for a long time. After lab work, renewal of medications, weekly visits and an appointment with a cardiologist specially arranged by the Open Door Clinic, she is now established with a new provider and getting the specialty care he needs. United Way hosts the largest single day volunteer event in the Chippewa Valley called Day of Caring. In 2016, over 900 volunteers were recruited to help 43 nonprofit organizations with approximately 80 projects. 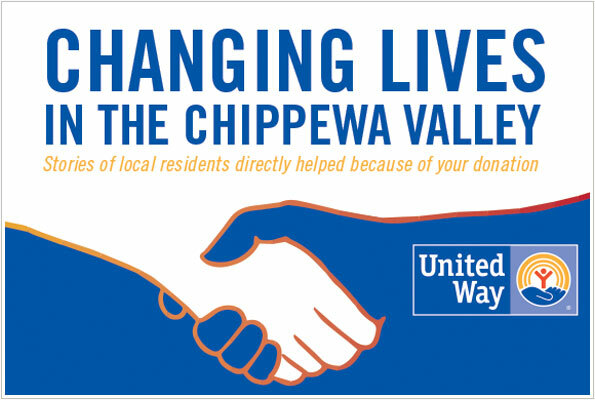 One project organized by United Way and co-sponsored by UnitedHealthcare is a food-packaging project which, in 2015 and 2016, had hundreds of volunteers assemble over 111,000 meals to local food pantries and food programs across Chippewa and Eau Claire counties. Pallet after pallet of food provided warm and nutritious meals on the dinner tables of families and individuals facing food insecurity.